So much has been happening and its all good! State Championships–place getters in a major regatta (3rd). Overall our times improved on previous years, but best of all paddlers stayed with the race plan and were able to give that little extra toward the end of each race – even the 6th, (you realise that was more than 3km we paddled.) Will we enter the 2km race next year? What were the contributing factors to the best performance we have ever put in? It must have had something to do with the 500g we collectively lost!! Seriously–paddlers put in huge effort with more training sessions, more intensity. You did all I asked of you and I didn’t hear one complaint – what you said out of my hearing was something else again!! Juniors – Not forgetting the huge effort they′ve put in. Bella took the role of drummer for first time at a regattar, while Hayden, Taylor, Alex, Megan and Elise were instrumental in taking the Torpedoes to hard won places. National Championships – again 5 of our Juniors proved their metal in Canberra this last weekend, taking out 5 Bronze medals – including one for the 2km race. Great effort all of you. The Torpedoes, a composite team from Port McQ, Coffs, Grafton and Orange were competing against teams like Snowy Mtns and Canberra Grammer schools, all of which have had dragon boating as a school sport for some years. Just what would our young people do if we could take a full junior team to regattas? Raffles at the Ophir Tavern under way, not too late to add your name to the roster – or come along about 3ish to give moral support to the ticket sellers – especially this weekend cos’ its me!! Barefoot Bowls – last Saturday was so good theres talk of it becoming an annual event. The locals had great time teaching some of our members to play. The ‘ditch’ had a good workout!!. Canowindra Bowling Club generously donated the green fees to DA Orange, which expanded the coffers by $415. Big thanks to Sandy for organising it – and giving some impromptu demonstrations of paddling technique. There is deffinetely growing interest in dragon boating coming from Canowindra – so hopefully Sandy will have some company on the trip over for training. Sound of Music – 06th May. Opening Night Tkts cost $39 adults, $25 Jnrs. Our allocation of tickets will be open to general public from tomorrow, so if you haven’t got yours yet, better contact me fast to get a good seat. There’s more events to come – more next month. Boat Purchase – its been ordered, the deposit paid – now all we have to do is find the rest of the money before delivery in June/July!! Hence all the fundraising, The Committee are looking at other ways to meet the outstanding amount plus a couple of members have said they are willing to provide interest free loan if needed.This is something you too might like to think about, it will only be used as a last resort. Boat Trailer – The road ready one I mean. Phil is completing plans and costings, we had very encouraging discussions with couple of business houses which will take costs down dramatically. Kaye’s dobbed husband Mark in to do the welding, tho if hes looking for help, Tracey has dobbed husband Steve in, not sure if Steve knows this yet. It will be so good to be able to head out west to train somewhere warmer during the winter months – we have to get fit fast next season, we’ve had a 2nd, now a 3rd , 01st is the only way to go! Winter Training – Lots of discussion on this topic. Usually with end of daylight saving midweek training ceases – however some are asking if we could start training at 5pm – while this glorious weather lasts, at least. Need your input – a survey will be going out with this n/letter. Saturday Training – deffinetely 7.30am until further notice (in past years we have gone to 2pm Saturdays only when morning temperatures drop). Totally Local – the everyday Farmers Market just out of town on the Mitchell Hwy has given CCDB Club 40 black caps, complete with CCDB and DA Orange embroidered on. At last we can all be wearing the same headwear. Check out the web site. Volunteers – CCDragons have been highly visible helping at regattas this season. Recently Kristy, Leanne and Issy were at Shellharbour with tides and weather making for an interesting day. Issy and Pam have been in Canberra volunteering at the Nationals. 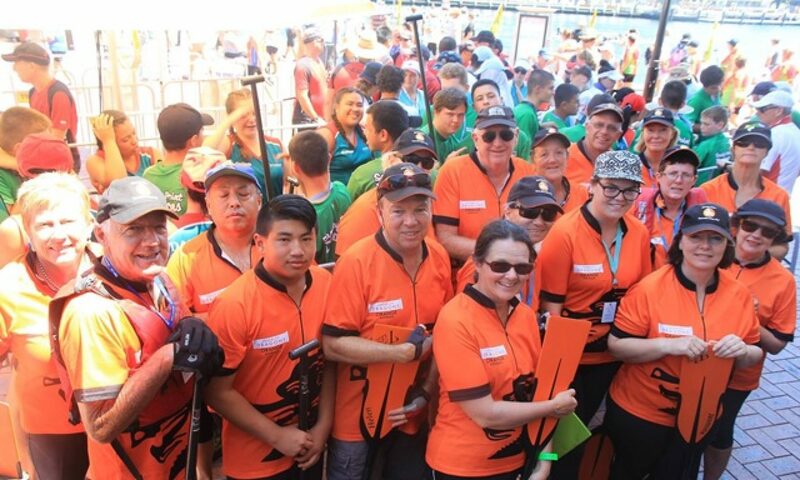 This is a great way to get to know dragon boaters from other clubs, what goes on behind the scenes and it’s a lot of fun – ususally. Ask George, he was boss boat aligner at the Corporate Championships at Penrith, it rained ALL day and theres no shelter out on those pontoons, I didn’t get wet at all in the Marshalling tent. Sweep training – Thank you to all those who have turned up for these sessions, Sweeps are a vital part of the Club. We seem to be the only club that has ‘Sweep Training Days’, in most clubs the sweeps have to learn on the job, which is fine but it is helpful to trainee sweeps to have the opportunity to focus entirely on their role and experiement. We all benefit in the long run. Jasmine will be going solo at first opportunity and I’m told the Bathurst trainee sweeps were very happy to have some help. There are some disadvantages to being a regional dragon boat club – but I wouldn’t swap with a metropolitan club! Paddle Order – I know its end of the season but I’ve had several people asking about getting the carbon paddles. To get the discounted price, plus your name, plus the coloured blade (orange) I need to place minimum of 10. Price to us: $168 (if you buy individually I think they are $180, or close to). I think the bags are still $50, could be $55. Let me know ASAP if you would like to place order, need to measure up for length. Blokes, Boats, Babes and Barbeques ­ – To celebrate so many good things that are happening in Colour City Dragons. Sunday 1st May. The challenge is out there – Men versus the Women race, the women using the boat with the foot blocks and a 4 boat length start – haven’t decided whether the men should have the sea anchor out!! Then we’ll have the members partners and friends racing against the members – handicapping the members of course! The losers cook the barbeque! We will have table set up with all our awards on display – to inspire us to better things next year. This may also be opportunity to get thank those who have helped us with sponosorship, materials and other assistance. Sunday pm is also an option – check the survey – let me have your thoughts by MONDAY 11th so decisions can be made.